Local and national cyber experts are developing ways to counteract the growing number of cyberattacks, and you could learn from them for free. You can now register for BSidesAugusta 2015, a cybersecurity conference that gathers experts from across the country to discuss the latest on cyberattack and cyberdefense strategies. The conference will go from 8 a.m. to 6 p.m. on Sept. 12 at Georgia Regents University. There is no cost to attend the conference, but space is limited. You must register by Aug. 1 on the BSidesAugusta website. All participants will receive a free t-shirt and lunch at the event. For more information, follow @BSidesAugusta on Twitter or email BSidesAugusta@gmail.com. Admiral Michael Rogers, Commander of the U.S. Cyber Command, Director of the National Security Agency and Chief of the Central Security Service, paid a visit to Georgia Regents University on Thursday to attend the graduation of both the Cyber and Health Science Summer Academies. Rogers, who took over as NSA Director in 2014, also addressed CSSA students at a separate meeting to talk about the future of cybersecurity. “Exposure to cybersecurity topics at an early stage in education is critical to the development of private and public sector workforces in which cybersecurity is an underlying competency,” Rogers said, speaking candidly with students after a short round of presentations. During the meeting, Rogers also noted Georgia Regents University’s ongoing commitment to cyber education. With the announcement of the Cyber Institute, and as one of only a handful of universities offering summer cyber programs to high school students, GRU is uniquely poised to become one of the region’s leading cyber-education authorities. After taking student questions, Rogers again stressed the importance of maintaining pre-college cyber programs that focus on developing skill, insight and understanding. “GenCyber camps play a critical role in developing these important talents,” Rogers said. Student presentations ranged from detailed accounts of key lessons taught to a live demonstration of a transposition cipher being decoded by students. Afterward, Rogers was presented with a photo of all the CSSA participants as thanks for attending graduation. 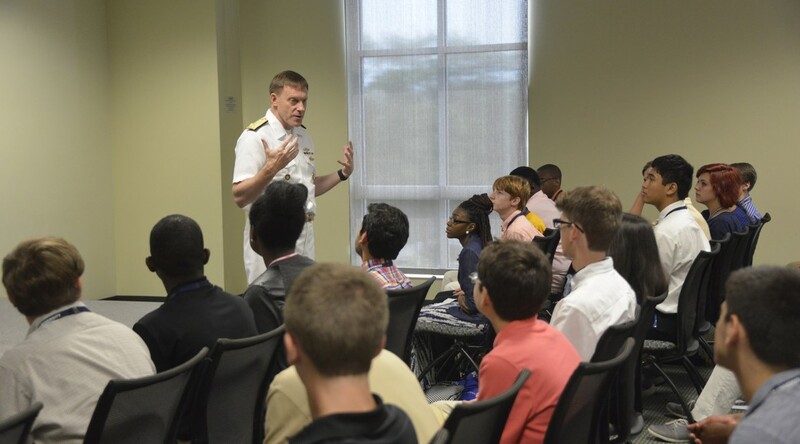 Rackley Wren, an 18-year-old senior from Augusta Preparatory School, said that in his chosen field, meeting someone like the admiral was an unheard of honor. Rogers previously visited GRU last October as part of GRU’s first annual Cyber-Education Summit alongside former Senator and Vice-Chairman of U.S. Senate Select Committee on Intelligence, Saxby Chambliss. With the number of cyberattacks increasing and major security breaches costing big companies and the U.S. government billions of dollars a year, investing in cybersecurity is a timely decision. This summer, GRU is one of 29 universities and college campuses across the country to organize and host the Cyber Sciences Summer Academy. This program will take place in two sessions starting June 21 and June 28 on the Summerville Campus. 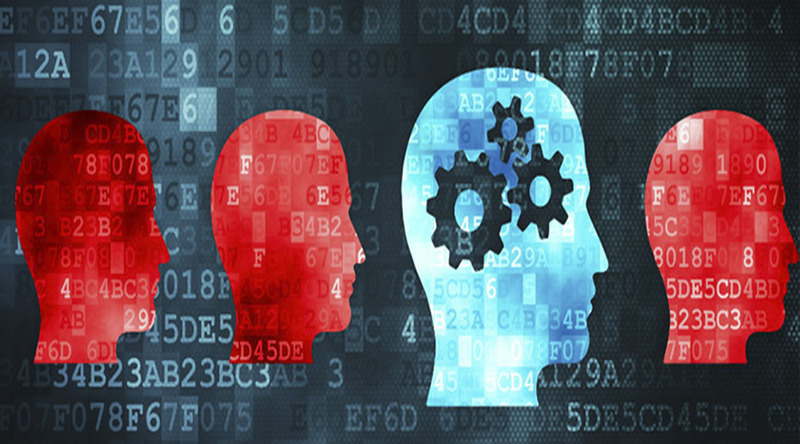 This summer academy is the result of GRU’s work with GenCyber, a program funded by the National Security Agency in partnership with the National Science Foundation. Recently, Chinese hackers stole personal information from about 4 million employees from virtually every U.S. government agency, officials told the media. They targeted the Office of Personnel Management, the human resources department of the U.S. government. The federal government is still assessing the impact of the cyberattack, the biggest hack to compromise federal employee data in years. Cybercrime can cost the global economy up to $575 billion per year, according to a report by the Center for Strategic and International Studies and McAfee, a computer security firm. This type of crime costs the U.S. almost $108 billion or .64 percent of the country’s gross domestic product annually. The report also estimates that about 200,000 Americans could lose their jobs due to the economic losses caused by cyberattacks. Cyberattacks on large companies increased 40 percent between 2013 and 2014, according to a report by Symantec, an information technology security company based in California. Last year also broke the record for “zero-day attacks” at 24 total. A zero-day attack refers to when cybercriminals use a hole in software to launch an attack without software developers even knowing about the flaw. The attack continues until developers learn about the flaw and launch a patch to fix it. In the top five zero-day attacks last year, hackers took advantage of software flaws for a combined 295 days before developers fixed the problem, according to the Symantec report. 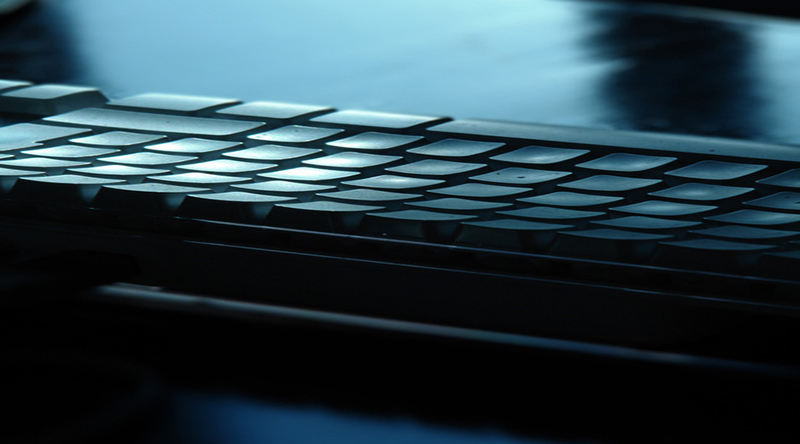 The creation of malware also went up 26 percent last year, according to the report. Nearly 1 million new pieces of malware were created per day. Mobile threats are also up, according to a poll by CyberEdge, a security consulting company headquartered in Maryland. Almost 60 percent of the 814 information technology professionals who responded to the poll said they saw mobile threats increasing in 2014. The respondents represented 19 industries in seven countries. Also, 71 percent of the IT professionals polled said their networks were breached in 2014. This number is up from 62 percent in 2013. Committing a cybercrime is relatively cheap, but the rewards are high, according to the McAfee report. The risk for cybercriminals getting caught is also low. To fight the growing number of cyberattacks, investment in cybersecurity has also grown. The National Security Agency and the National Science Foundation, for example, are investing $4 million on GenCyber, a program that offers young students interested in cybersecurity careers opportunities to learn first-hand about the latest technology in a university setting. 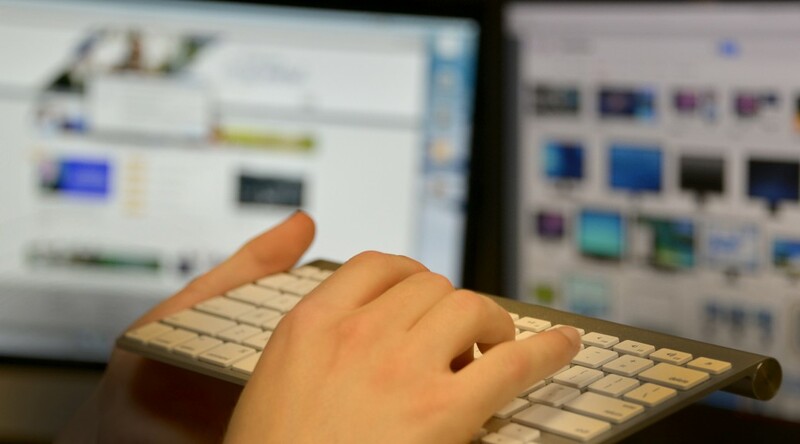 GRU has made cybersecurity a major strategic priority because of the subject’s importance for the Augusta area and the nation, said Gretchen Caughman, Executive Vice President for Academic Affairs and Provost at GRU. The U.S. Army Cyber Command is moving its headquarters to Fort Gordon in Augusta. AUGUSTA, Ga. – Georgia Regents University is one of eight institutions set to participate in the regional Southeast Collegiate Cyber Defense Competition (CCDC) being held April 7-8 at Kennesaw State University. The Southeast CCDC, as part of the National CCDC, is a competition in which students participate in the operational task of managing and protecting an existing commercial network infrastructure. Out of the 24 universities that competed last month in the Southeast CCDC’s annual Virtual Preliminary Qualification, GRU ranked among the top eight schools which secured them a spot in the regional meet. The winning team from regionals will then move on to compete in San Antonio, Texas, at the National CCDC, the largest college-level cyber defense competition in the United States. The competition will be held at the San Antonio Marriott Riverwalk April 24-26. “This is the first time GRU has participated in this competition, and to make it to regionals is testament of not only the quality of our curriculum, but the hard work of our students,” said Joanne Sexton, Director for GRU’s Cyber Security Educational Initiatives. U.S. Congressman Rick Allen (R-Ga.-12) toured Georgia Regents University and spoke with faculty members about GRU’s cyber education program and future plans for university facilities. 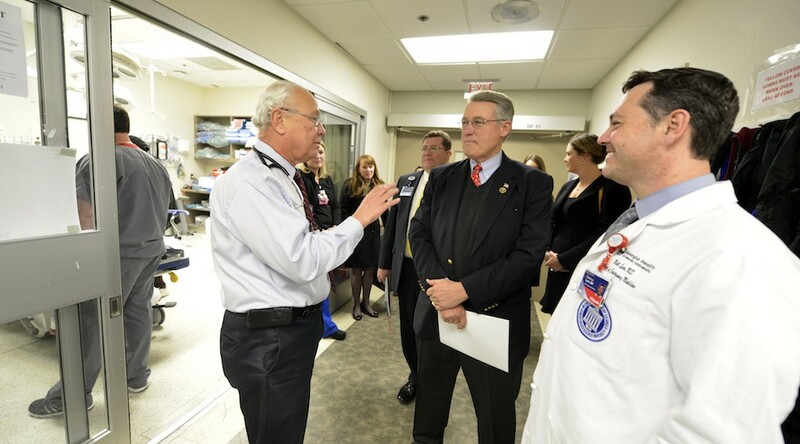 In addition to the GRU campus, Allen also visited Georgia Regents Medical Center’s Emergency Department and spoke with medical staff about initiatives they are implementing to strengthen emergency care and address challenges in rural health. Read more about the visit. Stars and Stripes featured the efforts of Georgia Regents University, Augusta Technical College, and the Columbia and Richmond County boards of education to develop a curriculum for students interested in pursuing careers in cyber security. Register now for the Cyber Education Summit at Georgia Regents University, Oct. 23. The summit, which begins at 10:30 a.m., will feature a keynote address from Admiral Mike Rogers, Director of the National Security Agency and Commander of U.S. Cyber Command, as well as other leaders from the NSA and the Department of Defense. The one-day event will include panelists from higher education, the Department of Defense, and industry. To see a full schedule or to register, visit gru.edu/cybersummit. Hear noted cyber author, instructor, and practitioner Bryce Galbraith describe how organizations are spending unprecedented amounts of money in an attempt to defend their assets on Tuesday, Oct. 7, at 7 p.m. in University Hall room 170 on the Summerville Campus. These companies are often one click away from losing national secrets, intellectual property, and PII. This presentation is sponsored by Hull College of Business in conjunction with the Greater Augusta ISSA (Information Systems Security Association). This event is free and open to the public. Georgia Regents University has joined leaders in industry, education, not-for-profit, and government to become a National Cyber Security Awareness Month 2014 Champion and help promote online safety awareness. Recognized in October, National Cyber Security Awareness Month was created as a collaborative effort between government and industry to ensure resources are available to help promote online safety and security.The awareness effort, now in its 11th year, is coordinated and led by the National Cyber Security Alliance and the Department of Homeland Security. “Cybersecurity is one of the most pressing issues facing our nation today, and as a Champion, we are committed to public education and discussion on how to create safer, more secure online communities,” said Shawn Vincent, Vice President of Strategic Partnerships and Affiliations at GRU. As part of its commitment, GRU will host a Cyber-Education Summit from 10:30 a.m. to 4 p.m., Thursday, Oct. 23, in the J. Harold Harrison, M.D. Education Commons on the Health Sciences Campus. Admiral Michael S. Rogers, Commander of the U.S. Cyber Command, Director of the National Security Agency, and Chief of Central Security, will provide the keynote address. For more information, or to register for this event, visit gru.edu/gov/cybersummit.php. Now in its 11th year, NCSAM is designed to engage and educate public and private sector partners through events and initiatives with the goal of raising awareness about cyber security in order to increase the resiliency of the nation in the event of a cyber incident. Since President Obama’s proclamation establishing NCSAM in 2004, NCSAM has been formally recognized by Congress, federal, state, and local governments, and leaders from industry and academia. This united effort is necessary to maintain a cyberspace that is safer, more resilient, and remains a source of tremendous opportunity and growth for years to come. For more information, visit staysafeonline.org/ncsam or dhs.gov/national-cyber-security-awareness-month.